I can’t think about a farm thematic unit without a little John Denver flying through my head. The smells, the sights, the sounds, and yes, even the joys of manure pies are among farm-life fun that I am always anxious to share with my students. A farm theme is a great example of how starting with a general idea can mushroom into many smaller themes. Actually every facet of a farm could lend itself to thematic instruction. After I present the broad theme of the farm, I let my student’s interests guide the way to the facets that most interest them. As with all themes, I like to start with quality literature. My favorite place to begin a thematic quest, is with my classroom, school, public libraries and places like amazon.com. One of my favorite books to begin a farm study with, is my all-time favorite, Mrs. Wishy Washy. This tale by Joy Cowley has been loved by all of my students for nearly three decades. They always beg for it again and again. Additionally to a farm study, it is a great book for an author’s study later down the road, as she has written so many great versions, and additional stories for this great character. This fun song encourages students to further enjoy Mrs. Wishy Washy and her farm. The original Mrs. Wishy Washy story does not have a cat, but imagine my students excitement as a cat is introduced in other stories like Mr. Dishy Washy, and Mrs. Wishy Washy’s Tub. The song also makes a great pocket chart song. With it's simple lyrics, students can easily build the song in the chart after it has been introduced and sung as a group. After you have selected the books, the songs, and the fingerplays, it is time to include all cross-curricular elements into the learning. Our thematic unit is packed with ideas! We have done most of the planning for you. We even include your own planning guide. The Auction: Making Sums of 10. The day G. told me that she doesn’t like her nose because it “isn’t cute” is the day I started writing this book. Our bodies are ours alone. They need to be honored, cherished, and loved. Do we all look the same? No. Do we all have magazine worthy bodies? No. But that isn’t what being “Me” is all about! As caring adults in a young child’s life, it is imperative that we build body positivity. This lifeskill needs to be fostered, developed, and nourished. In today’s society, children need to feel their own value and self-worth rather than the reflection of air-brushed magazine role-models. We are all special in our own special ways. The book I created for little G., and all children like her, is available here for you to use with your classroom filled with students, or your own children. You can find the book in its book form here: https://www.blurb.com/books/9330794-my-body-is-an-instrument, or find black and white or color copies here, with a couple companion worksheets below. Celebrate Earth Day, Arbor Day, or any day when it comes to saving our planet and celebrating Earth! I love to celebrate Earth Day when Spring is awakening the beauties of the earth. Whether you celebrate our planet for a week or a day, take note of this special day. Take a walk, plant flowers, or pick up litter with your students. Have a discussion around the concept of “Reduce, Reuse, Recycle.” Play a game, construct or paint a replica of the Earth. Whatever you do, it will help your students develop a greater awareness of their role in taking care of our Planet. Here are a couple of books that I like to enjoy with my students. First: Cut out a blue circle. Glue some irregular green shapes onto the blue. Make a sign (i.e. The earth is in our hands.) to place between the hands. For more detailed directions of this project or other Earth day learning games and materials, check out our Earth Day unit. For ideas, songs, math and reading games, literacy activities, and a construct project, check out our Earth Day unit. You may also want to use your Earth Day Thematic Unit as a springboard to the study of space, or as an introduction to Earth Science: Plants, rocks and dinosaurs. Today’s world is one of instantaneous inter-connectivity. Working collaboratively is an essential skill that must be taught, nourished and fostered in order to succeed in such an environment. Working as a team does not come naturally to an egocentric kindergartner. It is something that must be taught and practiced. Intentional teamwork activities allow students to work together for a shared benefit. Such activities will not only provide collaborative experiences, they will build many other social and emotional aspects of a student's self including: Self-management, social awareness, self-awareness, responsibility, decision making, caring about others, contributing, relationship skills, and more. Today we had a lesson on teamwork. After learning the vocabulary words opinion and decision, we did some role-playing that provided opportunities for students to practice coming to a group consensus. We then read the book “What’s The Big Idea Molly? Next I divided the class into groups and asked the groups to each make an animal that lives in the jungle. I then reminded the students to listen to each other’s opinions and decide how they would construct the animal. At the conclusion of the activity we had a debriefing. I asked the students what types of strategies their group used to complete the animal. I listed their responses on a chart. This was a great activity. And only one child cried! He was pretty mad that his group made the lion a girl lion instead of a boy. This was a great opportunity to talk about consensus. Even though it was not his opinion, he could support the group decision. And, everyone loved the finished product! Who doesn’t love adorable ducks! I love bringing the excitement of these friendly fowls into the classroom. If you have a farm store in your community (you can even find them in larger cities), it is easy to find baby ducks waiting for you right in the store. If I have a family ready to adopt the ducklings, I will purchase them, but I find the farm stores are generally more than happy to let the ducks visit your classroom for an extended visit, to only return back to the store to find their permanent home. If you are unable to secure live ducks, never fear. There are many ways to study ducks without the live examples living in a corner of your classroom. There are dozens of videos, books, and more to help you create a duck-like atmosphere. Life in a pond is filled with some of the most fascinating characters you can find. Consequently it makes for a great thematic unit!. Frogs, duck, turtles, alligators, butterflies, dragonflies, and other pond life are among some of my favorite creatures to study, because they are not only fascinating, but pretty cute! The study of pond life offers great opportunity for building vocabulary such as Living — Nonliving, life-cycle, observation, record, habitat, pond, environments. These vocabulary words are a great springboard for active experience with scientific principals. Today I am going to talk about Frogs! Frogs are easy to purchase! Did you know you can even purchase one on Amazon? I have purchased each of these in the past and they are quality products. You have to send off for the frog friend after the container’s arrival (which comes pretty quickly), so allow ample time for the purchase before you need the little frog friend to come to your classroom, or home learning space! These frogs are really hearty, have a long life, and grow quite big! Bring in some cute songs, fingerplays, and videos to enhance the learning. There are tons of examples of thematic fun you can add into your curriculum when it comes to frogs. Here are a few examples: Construction Frogs, Write about frogs, Frog subtraction or addition, Frog Frosties, Frog on a Log, Frog songs, Frog science. Create a science center. A place for students to learn independently the joys of scientific discovery. Add the academics. This pond thematic unit and supporting writing activities will have everything you need for frog fun, and strategic-academic learning that is linked to common core standards. Enjoy learning about animals and insects that live in a pond as your use this engaging "Developmentally Appropriate Thematic Unit" about Pond Animals. Life in a Pond is filled with authentic play-based learning activities that your students in your classroom and/or homeschool setting will love. All activities are strategically linked to Common Core Standards. Your classroom or homeschool students will love these Spring Themed Guided readers. Having an authentic paper book for your students to use at school and then take home will extend the learning. Make your writing center effective, challenging, and fun, by using these ready to use writing center materials. This Spring Themed "Developmentally Appropriate Thematic Unit" is filled with authentic active learning activities that will thrill your classroom or homeschool students as they learn important academic skills. "It's a Spring Thing" is strategically linked to the common core standards. It is divided into areas of literature, music, art, literacy, math, worksheets, science, creative writing, word wall, and guided reading. The activities are clearly written, easy to use, and need limited amounts of preparation. As I walked by a classroom yesterday, I heard a teacher yelling at a student with a very forceful voice and exaggerated body language. This immediately took me to another place and time, the time when Mr. Black karate chopped me so hard in the back of the neck that I peed my pants instantly in front of the entire class. Why, you might ask? Because I ran on a corner of the grass instead of the sidewalk. You see, Mr Black, had a very strict rule that grass was not a place for children. I was playing tag with my friends and in the chase, I took a short-cut across the grass to place the tag. And there he was — I froze in fear. He chopped, and I peed. “Go clean yourself up he growled.” (I wonder how my head stayed attached to my body with that forceful chop). I still fully feel the deep humiliation and shame that a small first grader should not have experienced. Still, 50 plus years later the experience brings tears to my eyes. I spent the remainder of that school day in soiled clothes, watching the clock. When I arrived home I went up to my bedroom and put on my pajamas and crawled in bed. I told my mom that I was sick. I was simply too ashamed to tell her the truth. “Come down and I will make you some supper.” My mom said as she lovingly put her arms around me and took me down the stairs to each some of her delicious cinnamon rolls. We live in a perilous world. A world filled with disadvantage, sadness, and inequity. A world where a young child does not always go home to a clean house with warm cinnamon rolls and loving reassurance from a caring family. Sometimes a loving and caring adult at school is the only safe person in a child’s world. William W. Purkey, the author of Invitational Education, addresses a 12 to 1 Ratio (Blue Cards: Positive, beneficial, rewarding interactions -- Orange Cards: Negative and/or toxic feedback and interaction) . According to Purkey's research, "Each person (even those with the best of circumstances) require at least twelve blue cards (positive experiences) for every one orange card (negative experiences) just to "make it through the night." This ratio indicates the strength of orange cards (negative or toxic experiences), and the actions needed to counteract them. When too few blue cards are received, or too many orange, the ratio falls "below minimum" and terrible things begin to happen. Individuals begin to lose self-esteem, optimism, and hope. This loss is coupled with the appearance of pessimism, hostility, and terrible anger. "Nobody likes me, respects me or cares about me, so I don’t like, respect, or care about others either." When children have experienced trauma, the ratio of blue to orange needs to be a staggering 19:1! Teachers: Please give out the blue cards freely! "The reason the blue and orange card metaphor is a valuable one, is that it serves as a constant reminder that everything people do, and every way they do it, is either positive or negative, beneficial or lethal, inviting or disinviting." says Paula H. Stanley of Radford University, VA (Read her full article here). Purkey reminds us further in his research that everything counts! "The way a phone is answered, a letter written, a word spoken, an office painted, a colleague treated, a policy established, a program implemented is either helpful or harmful." Maslow (1970) captured the essence of the blue and orange card metaphor when he wrote: “Let people realize that every time they threaten someone or humiliate or hurt ... or dominate or reject another human being, they become forces for the creation of psychopathology, even if these be small forces. Let them recognize that every man [sic] who is kind, helpful, decent, psychologically democratic, affectionate, and warm, is a psychotherapeutic force even though a small one." Teachers please treat your students with the caring and kindness they deserve. Be the kind of teacher who sends a child home happy and full of positive experiences. These blue card experiences have lasting effects, that can change the pathways of life. Thank you to the countless educators who are handing out blue cards to the point of exhaustion! A kind and caring adult makes all the difference in a child’s life. Two of my favorite thematic units are the Jungle and the Zoo. These two units are such great companions! I begin with the study of the jungle and then move into study of zoo animals. Kids love learning about animals, their habitats, and way of life. 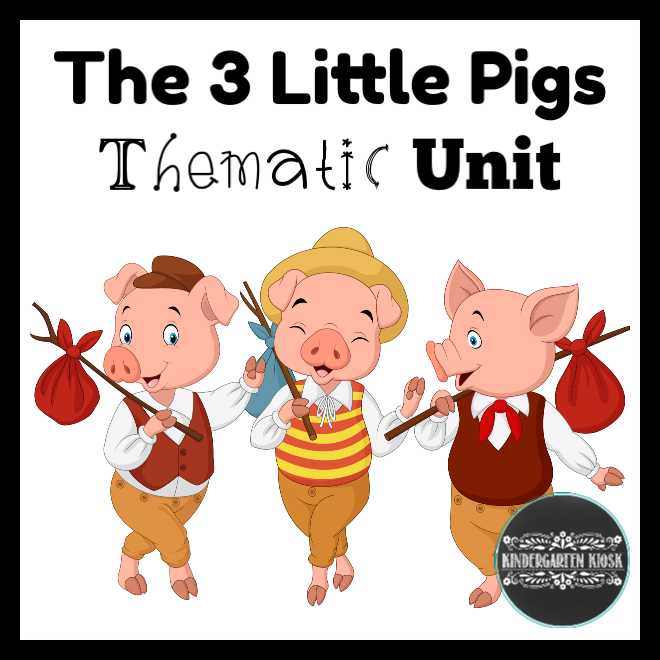 These fun units weave academic concepts into STEM in fun and engaging ways. Exciting and engaging academic content is also enhanced with this animal based theme. My kids love playing games such as Monkey Food, Zoo Zap, and Zero Zebras to practice targeted skills. I begin by purchasing a roll of jute and then ask my students to construct large leaves. I staple the leaves to the vines (jute), and weave across the ceiling of our classroom, or learning space. The magic immediately begins at this point. As we create snakes, toucans and more, the vines come alive with jungle life. Many of the students become so engaged with this transformation, they ask to take supplies home so they can create a jungle space in their own home. Next we move to the transformation of our dramatic play area. This space will now be filled with safari costumes, books, pictures, and realia of jungle animals. Binoculars, sketch pads, and more. I love to have my students involved in the set-up. The space has so much more meaning than if it is magically transformed in the evening when they are at home. Because we house animals in zoos to study and learn from, the science center is a great place to set up a zoo with a lot of STEM benefits. I have dozens of small plastic zoo animals that I place in the sensory tub, a box of small blocks of varying sizes and shapes, and some other zoo-making supplies. My students love creating and re-creating a zoo each time they step into the science center. I have plenty of books and photos of real zoos, paper pencils, and more, to help those creative juices flowing. There is always time for some high quality art projects. Creating the animals of the jungle is not only fun, but is a great way to extend reading experiences and build story comprehension skills. These activities below have been created at the end of each animal study. Hopefully, you have a zoo close to your home you will be able to take a field trip to enhance the learning. These field trips are some of my fondest memories of time-spent with my students. Since I no longer live field trip distance from a zoo, I now take them there virtually by visiting kids.sandiegozoo.org. Although it is not quite the same as that real-life, up-close experience, it is the next best thing. The live video cameras do allow students to see the animals interact with each other in their zoo habitat. And don’t forget to top off your study of amazing animals by celebrating with my all time favorite Ms. Frizzle as she takes that bus to the rain forest. *Full episodes are generally found on Netflix and/or Amazon Prime. My mom told me that she wanted to name me Kathy, but she went with Kathleen because I was due on St. Patrick’s day. I also took a DNA test that told me I’m 4.9% Irish, so I guess there is nothing to do but embrace this lighthearted holiday, which is based on a patron Saint in Ireland that died in 461. Wow! That is a long time for a celebration to survive. The community where I currently live has a giant St. Patrick’s Day parade, started by a an Irish settler in the community four decades ago. His goal was to give opportunity for everyone to act like a kid again, which is something I do every day! What better way to celebrate the luck of the Irish than a great thematic study of the holiday! The best way to start any thematic unit is by finding great books! Here are some of my favorites. There are so many great songs you can use to bring St Patrick’s Day to life in your classroom. One of my favorites to use is Michael Finnagen! This Singlish version is a lot of fun! Search Youtube and you will find many other great versions. It is also a lot of fun to teach your students an Irish jig to an original tune. Students especially love keeping their arms straight throughout the dancing. Again, you can find many other jig examples on Youtube. Planning all of the thematic learning across the curriculum is not only fun to do, it makes sense for the students! There are so many things that you can do with the connection of luck, green, leprechauns, gold, money, rainbows, and even parades. Of course, don’t forget Leprechaun traps! My favorite way of dealing with the construction is to have this a take-home-project if possible. I find that some great creativity ensues. For those who don’t bring a box from home, I simply let them construct something simple at the art table during centers or free choice — they are just as happy. And if you are lucky, you might just catch that leprechaun as it is trying to get out the window! All prizes and benefits valid for individual, first-time subscribers. No group or renewal purchases qualify for prizes or benefits. 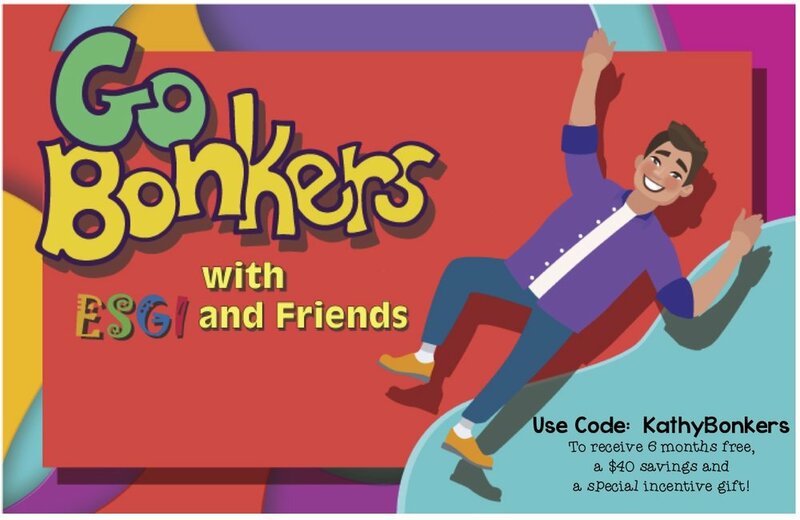 All trials and purchases must use bonkers, so please use the promo code kathybonkers. To receive $50 Amazon card, 6 free months and $40 savings: Purchase must be completed by Feb. 8, 2019. (New gifts each week throughout the promotion). Saves you over 400 hours a year! Guides instruction by providing you with real-time student data. Automatically generates parent letters & customizable flash cards. 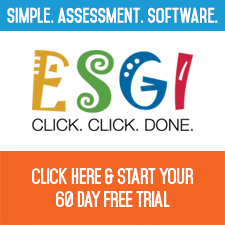 Grants you free access to thousands of customizable assessments or you can instantly create your own! I love constructing multimedia art projects with my students. Especially when it involves putting the child into the picture. Start off by having the children paint stripes of dark colors across the majority of the paper (I had the students use shades of blue, purple, and black). After the paint dries, they will use a permanent marker to draw thin, winter trees on the paper. Use white tempura paint to make snow using a paint brush to make snowy mounds at the bottom of the page and the Q-tip to make snowflakes in the sky. While the paint dries, take a picture of each child posing as if they are standing outside catching snowflakes. After the painting is dry, they can glue themselves on the page and use bits of construction paper to give themselves a winter hat, scarf, or boots. 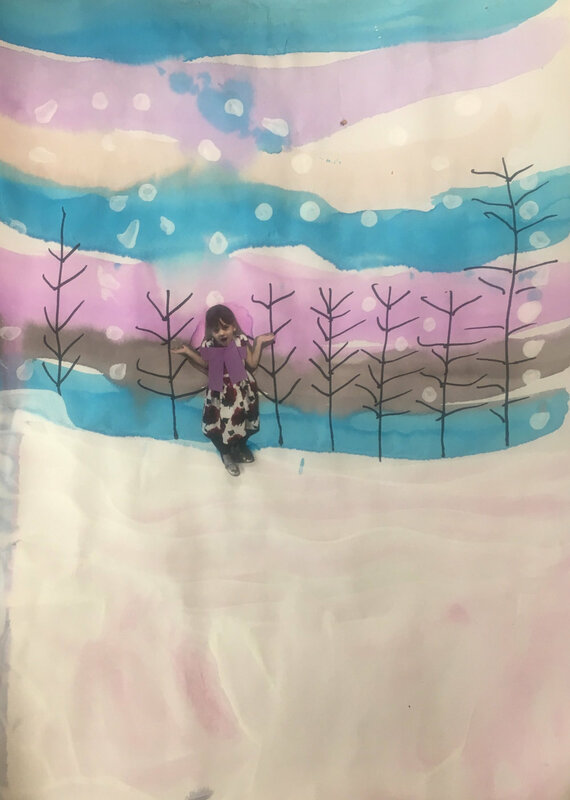 I really love this art project for it’s use of different mediums and techniques, and the children love it because they get to incorporate themselves into the winter scene. I think your kids will love it too! Help! I am in Shut-Down Mode. Has anyone else extended themselves so far that they actually shut down? My guess is that I am not the only one. After all, feeling spread thin is actually the definition of being a teacher, wife, mother, husband, father, or simply put, human being. I have to do something! My To-Do list is not going away any time soon. In fact if I don’t do something quick, it will simply get longer and longer. AH! Okay time to make my action plan. EXERCISE! I need some quick exercise. Okay, I don’t have time to go to a gym, and I moved away from my favorite Water Aerobics instructor, but there is something I can do right here and now. I can do a few quick minutes of Zumba or my 90’s favorite Jazzercise. (Just the still of this video brings a few endorphins to my brain). Now it makes me want to see if Richard Simmons and Jane Fonda are on youtube. 15 minutes will do the trick! 2. WORK! There is about 1/2 foot of fresh snow outside that needs shoveling! I bet if I bundle up and breath that fresh January air with a little quick snow shoveling, it will get me going. A short chore always gets the blood pumping. 3. EAT! What is going into my mouth? I have been cheating a lot with Christmas leftovers. It is probably time to detox my body and fill it with some high-quality fruits, veggies, and proteins. 4. DETOX from social media. Last night when I was working on a high stress project, I found at the end of a valuable 2 hours I had simply surfed Pinterest, facebook, and instagram. Time to set that social media timer. I have found that if I set a timer on my phone for 15 minutes, I look quickly at what I want to see and then move on. Timer it is! 5. SUN! So nothing like good old Vitamin D and the rays of the sun to make you feel energized. I wish I could book a cruise today, but I will have to settle for a Vitamin D pill and pay attention to a second hint that I need to get outside and shovel that snow. 6. CREATE! I haven’t pulled out my paints for quite some time. I need to take 15 minutes to set up a new project so that I can spend at least 15 minutes a day deep in artistic thought. I have about a billion hobbies to choose from, so I must be careful to select only one that I will use as my creative outlet on at a time. Painting! That is the one for now. (If I choose genealogy, the rabbit hole is hard to get out of. I must choose the creative outlet that can be time-bound when I am this busy). 7. BREAK! I need to reward myself. I have been wanting to watch Crazy Rich Asians for a while. I have owned it on iTunes since Christmas. I need to schedule that much needed break — at true break from my to-do list of projects — guilt free. I have to figure out how to break without shame. Hum. maybe popcorn? Maybe as a reward for hours of solid work? Yep! I am going to set the timer this evening for 2 hours. If I have worked solidly, Crazy Rich Asians will be watched without shame of “You should be working on ……". 8. BLAST OUT THE VOICES! Does anyone else have those voices in their heads that says “You should do more?” Or constantly compare themselves with another. Those negative voices in our head always push our thoughts to the worst-case scenarios or to the negatives of our perilous world! That negative inner voice can be our worst enemy. The best way for me to get rid of those thoughts is to simply keep a gratitude log. Every day (that I can) I simply write three things that bring me joy, for which I am forever grateful. Now you are going to see way fancier ones on Pinterest I am sure of that. Fancy isn’t my purpose. Some days I actually make real pretty pages filled with creativity. But most days it is simply a list or a quick page as is pictured. The point is for that 5 minutes of reflection of positivity! Goodbye negative thoughts and influences. Hello gratitude and positivity! 9. FUN! I love to schedule fun breaks! I always have a puzzle going or a game set up ready to play! It only takes about 15-30 minutes to completely loose myself in joy of genuine fun. Especially when I can talk someone into playing a game with me. Mystery Rummy is my all time favorite! It is basically Rummy with a twist! 10. PRESENT! Sometimes I am so bogged down with worries of future events and projects or with thoughts of things I should have done differently in the past, I forget that I can make right now PERFECT! I can make all the right choices, do the right things, accomplish the mounds of work, be there for everyone, be the best wife, be the best mother, be the best teacher, be the best of everything for 1 MINUTE at a time. Staying present as I go along helps fill my life with positivity. Two Friendly tips: First make sure you wear your favorite hat, and more importantly, SHUT THE GARAGE DOOR before you snow blow that direction! I am off to tackle that snow, eat an orange, and then tackle some tasks. I would love hearing how you self energize. Be sure to leave some feedback on facebook so I can hear your tips to get me out of this funk! And you might also want to print my reminder sign. I’m printing three! You might enjoy listening to this podcast episode for a few pick-me-up ideas. Developmentally Appropriate Teaching: Why Does it Matter? In America, there has been a rush for pushed-down academics to prevent the failures of students in older grades. The academics of preschools, kindergarten, and 1st grade have been pushed to a full year beyond the expectations of previous times. In fact, it is very common to hear people refer to Kindergarten as the new First grade, or Preschool as the new Kindergarten. Can young students learn beyond the expectations of previous years? Can they work through skills with rigor? Yes! But young children do not learn in the same way that older children learn, and often the proper methodologies for teaching in developmentally appropriate ways are ignored. Also, not all children are ready for learning milestones at the same time. Just as it would be foolish to say that any toddler who is not walking by 12 months is automatically behind in their development, it is not prudent to assume that because student’s move at different speeds along the learning continuum, that they are “at risk” or they are “being failed”. When teaching becomes an exercise in imposing the curriculum on a child rather than presenting a curriculum to enhance natural childhood, students are frustrated, early academic failure has been felt, school burnout at younger grades has occurred and the magical moments of childhood have been lessened. With the information of science, experience, and common sense, why is the practice of pushing down the curriculum such a common theme? The human brain is designed to develop, expand, and grow in a sequential manner. Undue academic demands that are contrary to human growth can disrupt this development. Our goal should never be to move children faster through the academic continuum; rather, our goal should always be to deepen the academics and to make them impactful, joyful, and truly meaningful. With the push down of curriculum, students are expected to sit quietly for longer amounts of time, ignoring the fact that young children learn best through direct interactions, active hands-on opportunities, experiential play, in a classroom filled with love, music, and discovery. The trend has become classrooms with escalated expectations, filled with passive and receptive experiences; moments filled with worksheets, and curriculum that is not purposefully foundational. These environments manifest a greater number of behavior problems than their Developmentally Appropriate (DAP) counterparts. Why is this? Simply put, students who are placed in inappropriate environments exhibit inappropriate behaviors. Children, especially the youngest students in the classroom, become frustrated with activities that involve being seated, being quiet, fine motor expectations beyond the growth of muscles, and curriculum presented above their level of cognition. Young children lack the sophistication of adults to verbalize their frustrations, consequently they become wiggly, disruptive, angry, and aggressive. Generally, this behavior is dealt with following school discipline policies rather that finding the root of the behaviors and adjusting classroom procedures accordingly. If we do not recognize those frustrations that are a result of pushed down curriculum as behaviors needing to be fostered in socially appropriate ways, are we not nurturing chickens rather than crows? Another unintended consequence of pushed down curriculum is the disruption of foundational skills; those developed sequentially and naturally in early childhood. In an earlier post we compared the teaching of reading with building a house. We discussed when constructing a home, no one begins with the roof. You don’t need construction experience or a degree in architecture to know that this will not lead to a successful end. Just as the building of a house needs to follow a certain order, skills for reading (and math) also follow a sequence. In fact, research has shown that most students learn to read following the same sequence of skill acquisition. When teaching with DAP methods, children have time to develop those crucial foundational skills such as phonemic awareness, alphabet knowledge, and number sense (all recognized as strong predictors for future success). In DAP classrooms, students are exposed to rich vocabulary, oral language experiences, story elements, deep literary experiences, dramatic play, experimentation, and rich moments of discovery. In the classrooms filled with pushed down curriculum, students are exposed to long moments of seat work, worksheets, way too many sight words, number problems at the expense of number sense, and laborious efforts of handwriting drills. Young children have a natural, intrinsic motivational system. They are born with determination, perseverance, problem solving, and a natural ability to learn from mistakes using, problem solving, and cause and effect. In fact, most young children feel they can accomplish about anything they set their mind to. Classrooms that are developmentally appropriate tend to foster that notion and allow children to blossom and grow in natural ways. Conversely, children who are subjected to environments not conducive to development become easily discouraged, anxious, begin to lose confidence, and learn to rely heavily on extrinsic motivators. According to David Liben, of Student Achievement Partners, play is not listed in the CORE because it is a method of teaching, not a goal. But the developers of the CORE fully expect teachers to be using play as a way to best teach the goals in the CORE. DAP and academic rigor are not opposing concepts. In fact, there is often more rigor in classrooms that are appropriate with a child-centered approach. The push-down of academic content is not going away any time soon, so it is up to the educators of young children to take that content and deliver it in ways that are experiential, playful, presented in a way young children learn. We must teach children academic concepts in a manner that makes sense to the world of a child; thematically and playfully. Using appropriate lessons, activities, games, art, music, science, dramatic play, writing, and more weaving them together to create beautiful moments of rigorous learning presented with the development of a young child in mind. If you would like to keep DAP in the early grades, please consider joining the Kinder Guardians facebook group. A place to ask questions, offer support, and collaborate with like-minded DAP teachers. Fostering the Five Domains of Human Development and a Freebie! Teaching is a performance skill. Like a dancer who practices muscle movements daily until his body can perform intricate dance routines with ease, an actor who studies unconscious body movements until she can recreate them on the stage, or a writer who knows all of the elements of a well written tale so well that she can construct a page turning novel, teachers learn and practice the elements of lesson design, behavior management and modification, and lesson delivery, until these become second nature. While studying Early Childhood Education as an undergraduate, I received tutelage from great instructors who were true early childhood theorists, Dr. Barbara Taylor and Dr. Sally Pena. Both of these women taught me the importance of including the five domains of early childhood development into every lesson plan. I remember the time I spent writing exhaustingly detailed lesson plans made specifically to include all five domains. The time turned out to be invaluable practice for my performance art, however, as now it is ingrained in me to be mindful of these important aspects of the learning of young children. Although I don’t write these mega-detailed lesson plans anymore, those domains of development are always fore-most in my mind when planning my kindergarten day. So what are those important areas of development? Gross Motor Development: Are the young children in our care using their large muscles daily? We must give students the opportunities to crawl, walk, run, skip, climb, and climb. Fine Motor Development: Do we give children opportunity to develop hand-eye coordination? The opportunity to control precisely the small muscles in their hands? We must give students the opportunities to color, write, use tweezers, tear paper, glue beans, build with small objects. Language Development: Are our students hearing stories with rich vocabulary, participating in vocabulary rich dialogues, participating in enriching phonemic awareness activities, and strategically practicing phonics skills? We must give our students a rich auditory and oral environment and be keyed in to their needs in vocabulary. Cognitive Development: Do we challenge our students with cause and effect, reasoning and problem solving skills? We must make sure that our teaching affords opportunities for neurological development and that we are helping to wire and in some cases, rewire, their young minds. Social/Emotional Development: Are we giving our students opportunity to be social? Do we have adequate opportunity for play-rich experiences? Do we foster a classroom environment of caring? Do we explicitly teach important life-skills? We can never underestimate the importance of social development to a young child. As I learned from Taylor and Pena, crafting lessons that include all of these domains takes practice, but after time, it becomes second nature. And, sometimes, you just might find a kind blogger who gives one away for free! Like this game, "Day Traders" that includes all five of the domains: Gross Motor (walking), Fine Motor (writing words), Language (Oral Language and Sight Words), Cognitive (Problem Solving) and Social/Emotional (Play Based). Homework That Is Flexible and Fun. Homework has become a hot button issue lately. Is it appropriate? Should it be sent home? Does it help academics? The truth is, that on Hattie’s scale of Visible Learning, homework only has an effect size of .16. Meaning, it really doesn’t matter if you send it home or not. Either way doesn’t have a large positive or negative effect on student learning. And this is a big “but”. Hattie scored parent involvement at an effect size of .50. Which is more than a year’s worth of learning!! That’s why the goal of any work I send home isn’t to extend the learning at home, it’s to get parents involved with their child. And the ideal way I’ve found to help involve parents is though games! With games, parents can engage with their children with letter recognition, sound identification, rhyming, blending, segmenting, decoding, sight words, important math skills, and more. Most children willingly play games with their parents, in fact, they generally beg for more. Most parents enjoy a game approach to homework because they are not only helping their children with academic learning and seeing firsthand where their child lies with academic skills, they are also having fun with them and enjoying quality family bonding time. Each packet features literacy and math games that are aligned to Common Core Standards. In addition, a version with Spanish directions is included with the kindergarten packets. I also have a different levels of difficulty. I always have at least a few kids in the class that end up going home with the “first grade packet” and, since the packets look nearly identical, they never know the difference. Make homework a positive and fun experience for your students! Each monthly packet has an easy to use parent guide to keep track of games played. There is no order the homework must be completed — completely flexible for busy family life. These packets are now on sale at a greatly reduced price, and are available in three levels: Preschool, kindergarten, and 1st grade. Homeschooler? These are also perfect for you. These homework packets will lay out an easy curriculum for you to follow throughout the year! Look no further for some great Christmas and Winter Thematic units for your kindergarten, preschool, Pre-k, T-K or 1st grade classroom. All of these units are cross-curricular, strategically linked to the common core standards, and scripted for easy use. We have designed these units to be cross-curricular, filled with strategic, developmentally appropriate, and purposeful activities. We know you will love the convenience of planning and lesson delivery. Everything included has been time tested with thousands of students in our classrooms. We know these activities work, and that kids love them. Also check out our companion sight word readers with some Christmas or Winter flair. Here are a few other supporting products with a Christmas or Winter theme. Your students will love making this adorable book of Christmas shapes. Not only is it a great and memorable keepsake, it is a great way to teach mathematical shapes to mastery. At the completion of the project my students usually pass off this common core standard with 100% accuracy; even the tricky hexagon! I have made this book with my students for years, each of them turn out unique and adorable. I simply use what I have available to complete a cute work of art made from a common shape. I vary the pages from construct (using construction paper), painting techniques such as marble painting, finger painting, etc., use fabric, felt, lace, ribbon, yarn, or whatever I have handy. I do create a page for students to use as support to scaffold their own original rendition. If you are lucky enough to have a die-cut at your school, cut out all of the shapes beforehand, along with all supporting pieces such as small strips of black for the reindeer antlers. Gather all supplies and have them easily accessible for your students. Some of the pages can be completed whole group, others are best to complete at a center with some adult assistance. You can complete some of the pages using guided art methods, some can be free creations (using the template die-cut shape). I have found the cookie and the ornament are two pages that lend themselves to creative freedom. Glitter is the secret ingredient on each page. I teach the students how to make small lines of glue, lay the piece in a flat tote and then sprinkle the glitter (or pinch the thumb and pointer together to pick up excess from the tray and sprinkle it on the page). Next, pick up the piece and dump all glitter back into the tray. If you teach your students this technique, glitter stays at bay. In fact, I am able to use glitter all year because they know how to correctly use the art product. If you are making a book that is already stapled or attached, as in this pre-purchased blank book, simply fold the other pages back and allow it to dry for a few hours or overnight. I generally do one page a day until my product if completed. This little crowdpleaser makes a great gift from the students to their parents! Yes! A gift that is cute, easy to make and even fulfills a Common Core Standard! Decorating a classroom tree with paper chains and popcorn. Drawing names and exchanging presents with my classmates. Lining up to present our presents to the teacher. Spending afternoons making crafts (like my cute Santa) and yes sneaking a taste of the paste. Learning how to sing “Silent Night” in German. Performing the Nativity as our Christmas Class Play. Making a Reader’s Digest Magazine into a tree and spray painting it green. Making a bowl out of clay as a present for my mom. Obviously the things teachers take the time to do with their students at Christmastime will create lasting memories, mine have survived over five decades. So as teachers work to make it through the exhaustion and chaos of the last week before the holidays, remember, you are creating memories that will not be forgotten. Here are some of my favorite activities I love to do with my students. These products are packed full of future memories.